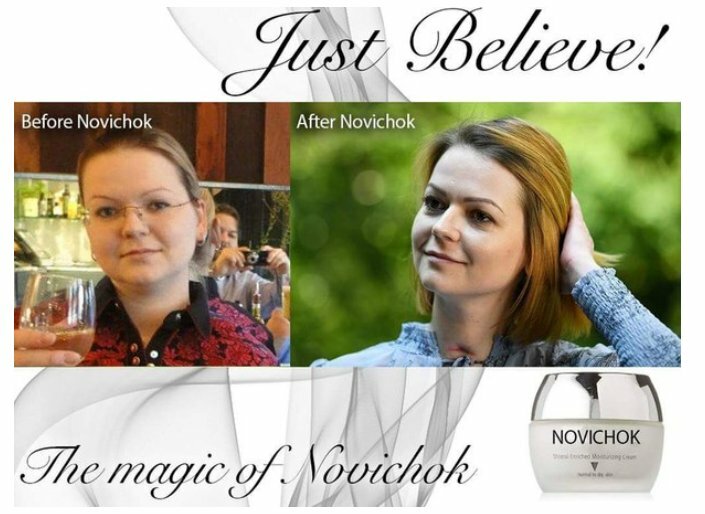 This before-after advertisement for Novichok perfume, featuring Yulia Skripal, made the rounds a while ago. Sergej Skripal and his daughter Yulia both mysteriously recovered from the alleged 'nerve agent' 10 times as deadly as VX. It was the magic of the Novichok perfume that did it. One victim of the second 'Novichok' incident in Wiltshire, Matthew Rowley, is also on the path to full recovery. His friend Dawn Strugess, a drug addict with serious medical preconditions, died. Like with the Skripal case the details of the second incident raise lots of new questions. [S]cientists have now confirmed to us that the substance contained within the bottle is Novichok. Further scientific tests will be carried out to try and establish whether it is from the same batch that contaminated Sergei and Yulia Skripal in March – this remains a main line of enquiry for police. How does a presumably highly fluid nerve agent in a perfume bottle fit the police assertions about the 'Novichok' "gel" on the doorknob of Sergej Skripal's house? 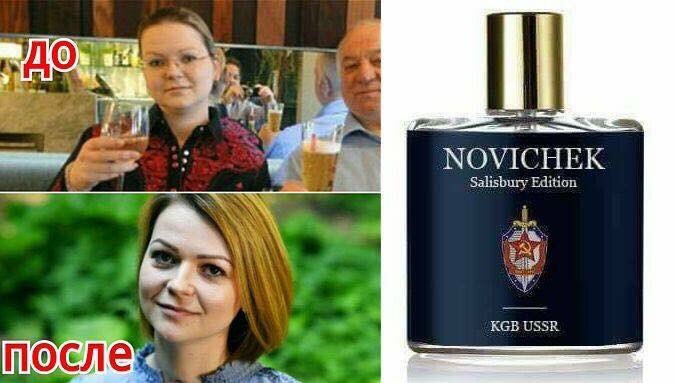 Was that the skin-care variant of the 'Novichok' beauty series? This is another hole in the official Skripal story the British government is putting out. That does not prevent 'officials' from spinning more nonsense around it. British investigators believe the March 4 attack on the former spy, Sergei V. Skripal, and his daughter, Yulia, was most probably carried out by current or former agents of the service, known as the G.R.U., who were sent to his home in southern England, according to one British official, one American official and one former American official familiar with the inquiry, speaking on the condition of anonymity to discuss intelligence. He does not give one example. Sergej Skripal was a British agent within the G.R.U. He was caught and sentenced to 15 years. After six years of jail he was pardoned and swapped in exchange for Russian spies caught in the west. He was no longer of interest. Killing him would end future spy swaps. The G.R.U. had certainly no interest in doing that. Galeotti is the non-expert who invented the "Gerasimov doctrine" which, he asserted, described Russia's ways to wage "non-linear" and "hybrid wars". Lots of nonsense was written about that idea. Three years later, after being called out, Galeotti had to admit that his interpretation of an article by the Russian Chief of the General Staff Valery Gerasimov was utterly false. Gerasimov did not describe a new Russian doctrine but the 'western' way of waging 'regime change' wars. Galeotti attributed the evil aspects of 'western' operations Gerasimov described to Russia. A similar misattribution is happening in the 'Novickok' tale.